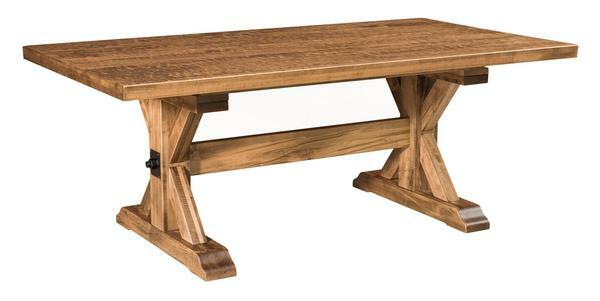 The Alberta Trestle Dining Room Table is beautifully crafted in a rustic style design and perfect for a country or rustic style home. Handmade with solid hardwood by our expert Amish woodworkers, this table boasts a strong yet elegant presence sure to add character and charm to the dining room or kitchen. Pair this dining table with a set of dining chairs, or mix in a trestle bench on one or both of the long sides for a gorgeous dining set that will last a lifetime. Furniture Specialists are available to assist with creating the dining table of our dreams. Contact DutchCrafters today!